Got back from my dad’s 60th-to-be in Aptos, and was wondering what to eat for lunch and dinner. As I wandered through the aisles at TJ, I decided on making a quick and delicious pro/mozz sandwich for lunch and on using many of the same ingredients for a pizza later that night. Pre-heat oven to 450 degrees. Follow directions to make the pizza dough (i.e., put it on a floured surface, let it sit for 20 minutes, hand knead). Then, put on a lightly oiled pizza pan (I used about 70% of the dough to make one pizza, reserving the rest of the dough for another, smaller pizza). Meanwhile, separately cook the bacon pieces and garlic over the stove. Put a layer of pizza sauce on the pizza dough. Then, top with mozzarella slices, and then the cooked bacon pieces and garlic as well as some fresh tomato slices and garlic. Put the pizza into the oven for about 6 minutes, and then take it out and put the arugula on, before heating the pizza for another 2 minutes or so (total cooking time: 8-10 minutes). Add some fresh pepper to taste, and serve! I par-baked the pizza dough (sans any sauce or any toppings) into the oven first, for a couple of minutes, just to make sure the dough cooked (and the toppings didn’t over-cook). That worked out well. Sometime in the future, will try to make the dough recipe from SOC’s book from Maine. 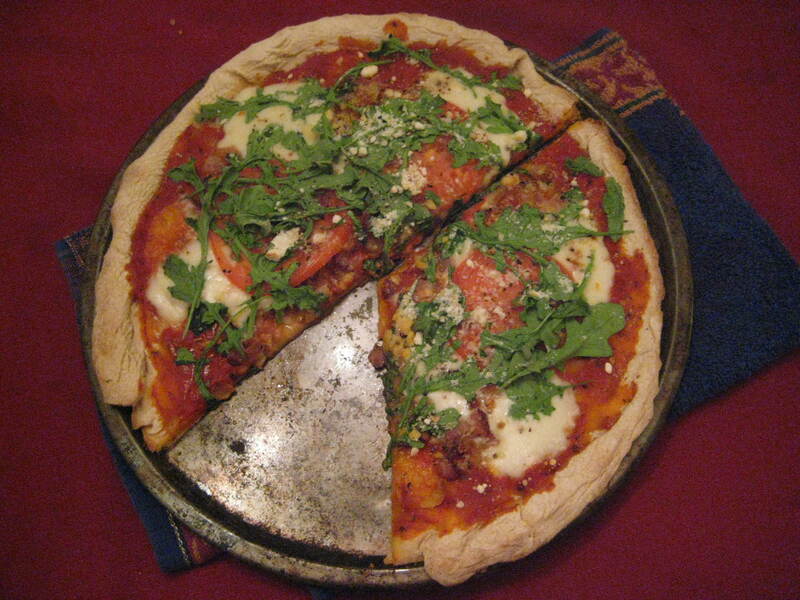 This entry was posted in Italian, Main Dish, Recipes and tagged Pizza. Bookmark the permalink.